I wasn’t a football fan. I didn’t watch a single game from the years 1992-1999. I didn’t care, I was busy with photography. Then the Boise State Broncos started to win. A lot. They were making headlines. I saw clips on my TV of Bart Hendricks (Boise State Quarterback 1997-2000) doing crazy-falling-down-side-arm-passes into the endzone. I was intrigued. It was a new sensation for me. I was part of a winning town. Holy Smoke, Boise State is winning! It was awesome. Our local boys were winning! Honestly, I thought it was a novelty. The Broncos are winning and so what? Next year they’ll go back to regular mediocrity and we’ll all get back to work. Then they kept winning. It didn’t end and then one January day in 2007 I found myself hopping, crying and hugging my Brother in Law in Phoenix when the Broncos beat Oklahoma in the Fiesta Bowl. I had never hugged him before and not since. Isn’t it amazing what a football game can do to bring a family together? That Fiesta Bowl game was so emotional that I became sick, fluid oozing from my nose sick, for two weeks after the game. It was the greatest live event I’ve ever witnessed. It was transcendent. All the Boise State fans stayed in the stadium through the trophy presentation and the team exiting the field and as long as they could to prolong the feeling. I was living in California at the time. When I got home all my friends commented how exciting the game was. They were becoming Boise State fans too. I couldn’t believe it. After that game a lot of the players graduated. A new quarterback came along, Kellen Moore. I thought, well, it was fun when it lasted. They lost a couple of games and their bowl game in Hawaii. Then they started winning again! TCU beat them by one measly point in the Poinsettia bowl in 2008 and then they beat TCU in the 2009 Fiesta Bowl. I should mention that they beat TCU in the fiesta bowl after an undefeated season. Now they’re ranked 3rd in the AP poll. Higher then Florida, Texas, Oklahoma, Nebraska, USC, Penn State, LSU, Georgia etc…I never, ever could have predicted their progress. It’s been an amazing ride. Yet with all of this fervor and excitement I question my fanship. Am I what people call a fair weather fan? I love it when they go undefeated but I question my loyalty when (or if) they lose a couple of games. It’s sad to me. My brother’s and brother’s in law are real fans. They are loyal to the team, the university and the city of Boise. It’s very endearing to be loyal like that. It’s an amazing quality that you are born with, or not. I’m surrounded with real fans. 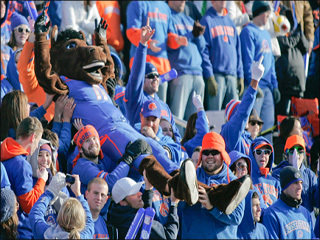 My niece was featured on the ESPN website wearing her bronco head. My brother has developed a unique, one of a kind, “fan voice” that he likes to use at Boise State games. That fan voice is FUNNY. It’s one of my favorite things about the Boise State football craze. I’m personal friends with the both the Boise State Elvis (one of them) and Bronco Libre. Its awesome! Boise is like an island. We’re 350 miles from Salt Lake City to the south-east and 480 miles from Portland to the west. It’s a real community with its own personality and character. People love living here. The excitement that Boise State Football brings to our town is indescribable. Last night on the news they unveiled the new uniforms. It’s big news around here. I feel apprehension about the emotional impact of the upcoming game. It’s billed as the “programs biggest game ever”. I don’t know about that. Two fiesta bowls and Oregon last year could argue with that statement. I don’t want to get sick again. Maybe that’s why I won’t fully commit to my fanship. I’m afraid of the emotional rollercoaster that could happen. Next It’s just a bunch of cheezy kids toys on a random bed. I’ve also wondered about my status as a Bronco fan. Even thought I’m a Cougar alumni, I find myself cheering more for the home team. I tell myself that I did go to BSU for a semester. I guess the 34 years in Boise beats the 3 years in Provo. Go BRONCOS!! Aggie alum. Bronco fan. It’s awesome! 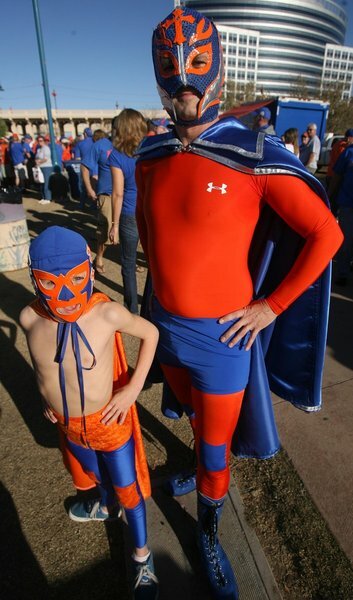 Who is behind the Luchador mask we got pictures with him at the fiesta bowl. GO BRONCOS!! That is my buddy Tim. I’d like a photo of you in your Elvis get-up for the post if possible. Go Broncos! I am a Canadian, but born in Emmett ID, and a crazy Bronco fan. By brother-in-law is the fan legend bronco libre and I just wanted to share the bronco love. Many football fans I know up here in Canada root for the Broncos and look forward to them being part of the eventual downfall of the corrupt BCS system so that we can one day really play for the championship. Go Broncos!